Picking the opening act for this series was easy – but selecting the opening song was very difficult. Enjoy Revolution. 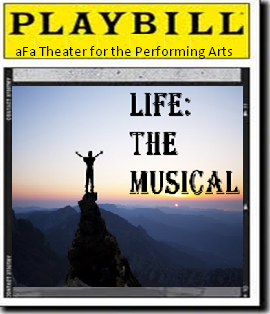 Life: The Musical is an original aFa production is a journey featuring songs of about life. Each act features an aspect of life as a theme with music supplied around that theme. Life … the time for the living to live. One’s life starts when one is born. Shortly thereafter, we are given something that stays with us no matter where we go – a name. Immediately, we are nourished, so we grow physically, mentally, and emotionally from babies into young children … and that’s when we start to dream about our future life. Growth never stops, so from children we move on as teens .. but school is still much of life at this point. Eventually, we move into adulthood as women and men, and the work world is a prominent feature in life … but work isn’t the only thing in life. After all, who would ever believe that life is all work and no play! Act 10 is about play as in fun, so song titles must include Play, Playing, Fun, or a fun activity (as in swimming). There is much latitude in this act, thus a lot of room for error … so make your selection with care. IMPORTANT: 1) Include the title and artist in your comment, and 2) an occupation can only be used once. Right here on this stage aFa Productions presents is an American icon to kickoff Act 10. Ladies and gentlemen, welcome The Boss … Bruce Springsteen Dancing in the Dark (with a young Courtney Cox). Hooray! Spring has definitely arrived in Cincinnati as this weekend’s weather was wonderful. The warmth got me out to do some yard work, which included the season debut of the mower. No ballroom time for us this past weekend as we took a Reds game on a slightly chilly Friday night with the Reds thrashing the highly regarded Nationals 15-0. Our dinner group got together Saturday night for a variety of chicken wing recipes! Not our normal food fare, but we had a good time. How’s the weather in your land? How was your weekend? Come on now, time to share! For your Monday Morning Entertainment, here’s a dose of Mel Brooks to jump-start your week. I recall an interview with him as he was promoting the movie where he said, “Movies need a big music number.” Enjoy … and have a good week. I did not plan to start the day like this, but I just discovered something that I had to share. With that in mind, here is a cheap rendition of Opinions in the Shorts, which I hope returns next week. Speaking of next week, things may return to normal here! … Maybe. For those who have enjoyed my photos of Italy, Christine’s images of her trip last fall are fabulous. Here is an index of her posts. Well done, Christine (a fellow Cincinnatian)! I appreciate this Kathleen Parker column about Republicans in Name Only. Cincinnati Reds Opening Day is less than a month away. Click to see whom the people want as the next pope. Hansi has a great sense of humor. Well, some say “sick” is a better descriptor. Nonetheless, his creation myth is a hoot. This fun video from my local news this morning sparked this spontaneous post … and it’s totally a capella. Enjoy the effort by a young South Korean. Have a good and safe weekend. Be well, do good work, and keep in touch. I hope everyone had a good weekend, so a Monday greetings to all! Gads – I know that some hate we morning types. A different weekend for me since my wife is cruising the Caribbean without me – Duh – What’s up with that! But hey, I made the best of the weekend by some ballroom dance, a salsa pattern workshop, a delightful evening with two friends (which include wine and deep discussion), plus attending a party for my great-nephews first birthday. Come to think of it, he reminds me of the person is yesterday’s post. Meanwhile, on to your Monday Morning Entertainment. Last week featured an artist making outstanding art with a salt shaker and a piece of paper. For this week, what if we take away the salt? Watch and tell me what you think, plus about your weekend. I hope everyone has a good week. Thanks Kay for finding this video.